Tenants and property owners in the Atlantic Yards footprint have received letters from the law firm Berger & Webb, which represents the Empire State Development Corporation (ESDC) in its pursuit of eminent domain, telling them it'll be time to move soon. One complication: the letter offers only services of a real estate agent and a modest $5000 stipend for residential services, not mentioning the offer by Forest City Ratner--which was part of the General Project Plan (GPP) and Modified General Project Plan--to those in residence for at least one year to "return and to rent a comparable unit within the Project Site at a comparable rate to what they are currently paying." The absence of an offer to relocate tenants into the project--as state law recommends but does not ensure--prompted a protest by George Locker, who represents eight rent-stabilized residential tenants in the project footprint and has filed a number of lawsuits on their behalf. 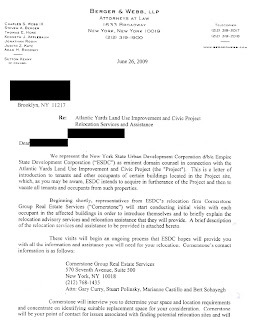 But Empire State Development Corporation spokesman Warner Johnston said, "The letter is just intended to alert occupants that representatives of The Cornerstone Group, our relocation consultant, will be in the neighborhood and contacting them soon, and it includes the basic parameters of the relocation assistance that ESDC is providing (essentially verbatim from the General Project Plan), such as referrals to alternative housing, provision of moving services, etc. The General Project Plan also references some additional assistance that FCRC has been and will continue to provide for residential tenants, such as relocating residents back on the Project Site as soon as feasible (if that's what residents desire) and providing interim rent subsidies. 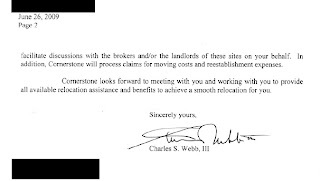 The referrals to alternative housing to be provided by Cornerstone (mentioned in the letters of introduction) will include coordination with FCRC as necessary with respect to this assistance." Beginning shortly, representatives from ESDC's relocations firm Cornerstone Group Real Estate Services ("Cornerstone") will start conducting initial visits with each occupant in the affected buildings in order to introduce themselves and to briefly explain the relocation advisory services and relocation assistance that they will provide. Cornerstone will interview you to determine your space and location requirements and concentrate on identifying suitable replacement space for our consideration. Cornerstone will be your point of contact for issues associated with finding potential relocation sites and will facilitate discussions with the brokers and/or the landlords of these sites on your behalf. In addition, Cornerstone will process claims for moving costs and reestablishment expenses. Cornerstone looks forward to meeting with you and working with you to provide all available relocation assistance and benefits to achieve a smooth relocation for you. Cornerstone, which has a placeholder web site (listed here), is a member of the International Right of Way Association (IRWA). Since its inception as a not-for-profit association in 1934, IRWA has united the efforts of its members toward professional development, improved service to employers and the public, and advancements within the right of way profession. IRWA is the unsurpassed source of right of way educational programs and professional services worldwide. IRWA includes "multi-disciplined professionals employed by private industry and government agencies": acquisition agents; appraisers; environment professionals; engineers; lawyers; property managers; relocation assistance agents; surveyors; and title experts. Referrals to alternative housing will be provided to displaced residential occupants. Cornerstone will meet with the Project's residential occupants to assesstheir particular housing needs and to assist them in finding replacement housing. Real estate brokerage services will be made available at no charge to the occupants. Moving services and expenses will be provided. This will include payment for the costof the physical move, including the cost of transporting personal property to thereplacement housing location, labor and material, insurance and storage as necessary ("Moving Costs"). ESDC or Cornerstone will bid out all moves and selectthe lowest reasonable and responsible bid. The occupant either may use the selected mover or may conduct a "self-move" and receive the amount of money that ESDC would otherwise have paid to the selected mover. No Moving Costs will be paid until the premises are vacated. Moving Costs will be uncapped as to amount. 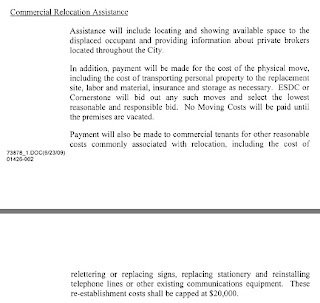 A relocation assistance payment will be made to each vacating occupant. A one-time payment of $5,000 per household will be made available to each vacating residential occupant or family to assist in meeting additional expenses encountered in establishing new living quarters, such as telephone and other utility hook-up charges, new return address labels, etc. This stipend is also intended to compensate occupants for the inconvenience of having to move, and to encourage them to vacate their units as quickly as possible. The above described residential relocation program is the minimum assistance that will be provided. The Project Sponsors have entered into a Community Benefits Agreement whereby they agreed to provide certain enhanced benefits to occupants who were in occupancy of their residence for at least one year. Such benefits include the right to return and to rent a comparable unit within the Project Site at a comparable rate to what they are currently paying. (g) in the case of all projects, that there is a feasible method for the relocation of families and individuals displaced from the project area into decent, safe and sanitary dwellings, which are or will be provided in the project area or in other areas not generally less desirable in regard to public utilities and public and commercial facilities, at rents or prices within the financial means of such families or individuals, and reasonably accessible to their places of employment. Insofar as is feasible, the corporation shall offer housing accommodations to such families and individuals in residential projects of the corporation. The corporation may render to business and commercial tenants and to families or other persons displaced from the project area, such assistance as it may deem necessary to enable them to relocate. Locker complained that ESDC is required to offer residential condemnees displaced by the Atlantic Yards Project relocation into the completed Atlantic Yards Project and interim rental housing into affordable and desirable rental apartments in the project area. "At this time, I do not know whether ESDC is simply trying to rip off displaced residential condemnees who are unaware of their statutory relocation rights, or whether ESDC is ignoring the UDC Act entirely," he asserted. "As matters stand, ESDC’s stated relocation program is unlawful on its face." As noted by the bolded language, the UDC Act seems to offer wiggle room--though Locker contends that relocation into the project is feasible, given that it would include housing, not simply commercial space. Locker previously filed suit challenging the relocation plan, charging that it was illusory, given that it would hardly guarantee similarly affordable housing to rent-stabilized tenants--paying rents well under $1000--in today's real estate market. An appellate court upheld the relocation plan, but Locker said this week he would challenge it. He asserted that not only is the process unlawful under the UDC Act and contrary to the GPP, the eminent domain process is not final--given the pending appeal--and "relocation is premature as a matter of law." As for whether it's premature, I asked the ESDC's Johnston if timing of the relocation effort would be delayed because of the appeal in the state eminent domain case newly pending before the state Court of Appeals. I didn't get an answer. 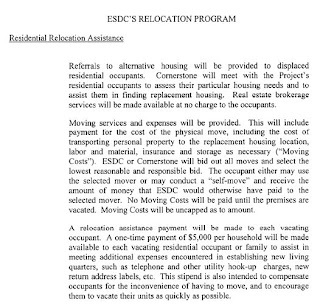 The 2-page attached document is entitled "ESDC's Relocation Program" and the first heading is entitled "Residential Relocation Assistance". It fails to offer relocation benefits mandated by law. Period. Now ESDC calls it merely a letter of introduction? Sounds like they are taking lessons from that basketball coach. ESDC has shown itself to be incapable of following any aspect of the laws applicable to eminent domain. It seems intent on giving the courts new reasons to scrutinize this utterly corrupt process. We will oblige. What? The ESDC is incompetent and/or deceitful and/or ignorant? Shocking, I say! Shocking! !